Look at me, getting all pretentious with a casserole! But I have a very good reason: You see, I had originally planned to make this dish for the upcoming International Incident Nostalgia Party hosted by Penny aka Jeroxie of the super cool blog Addictive and Consuming, but I ended up going in a rather different direction for that. (You can check it out this Saturday.) But once the notion of a kicked up tuna noodle casserole started rattling around in my head I just couldn't rest until I had a taste. My version is modeled on the Stouffer's frozen variety that my mom used to "make" for me when I was a kid. It was one hot mess of a trashy dish, but I loved it. Oh, it had it all: scant bites of tuna, long, slippery overcooked noodles, and a strange half-crunchy half-soggy bread topping, all bound together by a thick, gloppy, vaguely mushroom-y mystery sauce. What's not to love? Now, I know full well that this is one of those instances where the memory far outstrips the reality. So I wanted to recreate the comfy, safe, homey feeling of eating that nasty casserole that my mom so lovingly heated up for me, only with flavors and textures that my grown up self would appreciate. At the same time, I knew that I wanted the dish to somehow evoke the original. The results? A smashing success. Instead of soggy bread crumbs, I used crispy fried shallots and chopped chives. For the tuna, I stuck with canned, but used the incredibly flavorful oil packed Genova brand. Rather than that gooey binder of yore, I made a bechamel-based mushroom sauce with a white wine reduction. In place of overcooked noodles, I used tiny little Hungarian eperlevel pasta that I got in Budapest. And the whole thing was topped with a sprinkle of truffle salt and a drizzle of truffle oil. Heaven. In a sautoir over medium heat, saute the onion and celery in 2 tbsp of the butter until soft. Add the mushrooms and cook until they release their liquid. Stir, and allow to simmer until the liquid nearly evaporates. Add the wine and allow to cook until evaporated. Season lightly with salt and pepper; set aside. Meanwhile, in a saucepan, heat the remaining butter over medium heat. When it's bubbling but not browned, add the flour, reduce the heat slightly, and stir until the roux takes on a pale blonde color. Slowly incorporate the milk and whisk over medium heat until the liquid thickens. Season to taste with salt and white pepper. Gently stir in the mushroom mixture and cook over medium low heat, stirring frequently, for about 5 minutes. Turn off the heat and cover with plastic wrap so it doesn't form a skin. Cook the pasta in well salted water until al dente, drain, toss with just a tiny bit of butter, and combine with the tuna. Next, gently fold the sauce into the tuna/pasta combination. Don't add the sauce all at once, as you don't want your casserole to be too wet. Transfer to a 1 quart casserole, and top with a thin layer of remaining sauce. Bake in a preheated 350 F oven, uncovered, until the top is brown and bubbly. While the casserole is baking, prepare the topping. Toss the sliced shallots in the cornstarch and shake to remove excess. In a cast iron or heavy skillet, heat oil to 250 F (use enough oil to just cover the shallots) and fry until golden brown. Remove to drain on paper towels. When the casserole is finished, top with truffle salt, truffle oil, fresh ground pepper, the shallots, and the chopped chives. If, like me, you grew up enjoying the sodium-packed goodness of a Stouffer's tuna noodle casserole, this will simultaneously take you back and indulge your adult palate. If you didn't grow up with frozen foods, then you can like this dish on its own merits, I promise. Very pretty wish I could eat that ! This looks simply amazing and the sauce sounds so luscious. Somethig I shouldn't miss. Thanks for sharing. The pics look stunning as well. How snazzy is this?! I feel I should be wear my best dress and heels to cut into this tuna casserole! I love the crispy shallots on top instead of soggy breadcrumbs(which I still use in mine, btw). Thanks for sharing! I've never had a tuna casserole. Maybe I should try this. It looks great ! This is such a beautiful and very gourmet casserole! 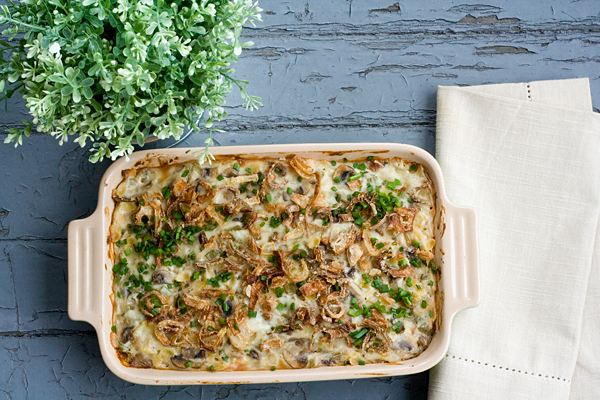 It looks like such a comforting treat with the wonderful bechamel sauce and crisp shallots. whatever mom cooked is always tasty, she put here and there and make something delicious. As inspiration from your mom, they should be tasty . I am quite certain that I have had the exact casserole you are referring to... several times... and grandma's house while we were growing up. Had I known that it merely takes a few shakes of truffle salt to call something "Truffled" I would have insisted on taking some with me each time she babysat us. I could have then 'truffled' all the Stauffers and Swansons foods she tried to pass off on us! The light looks lovely on it. Doesn't it? I'm really excited about trying this because I don't make casseroles that often nor do I eat tuna that much. Great recipe! "trashy dish" LOL! I loved that stuff, too! But this is the best looking tuna casserole I have ever seen... you managed to make a casserole look like a million bucks... Love all the yummy goodness you put in there! This post is like poetry... good poetry. I so so want this casserole right now and so so curious what you are going to bring to the party on Sunday!!! Oh, this is definitely a must-do! It's gorgeous. You clever, clever, lady. Thanks for creating and sharing. Aw, this totally reminds me of my Mum's Tuna Mornay, which is so very simple to make but never failed to produce a shout of joy from me when I learnt we were having it for dinner. I haven't made it for ages, I must fix this! My parents used to make tuna casserole a lot growing up. It's a good inexpensive meal that kids will love. The truffles take it to a new level! Stouffer is not my thing, but this one IS! OMG--this is exactly what I need right now: comfort food and childhood comfort food at that! My mom sometimes burned the little tray the Stouffer's came in. (Nice, real nice.) Your version is lovely! My hubby ALWAYS request tuna casserole for Lent...and I try to ignore him. Well, I'm making this soon...THANK YOU! Hey Trix, I'm jealous you got Stouffer's tuna casserole. My mom made tuna casserole with Campbell's cream of mushroom soup, canned tuna and frozen veggies with saltine crackers on top. My favorite part were the petite frozen peas. I would love to try your casserole, wow, you have elevated an old favorite to another level. @Kelly: Oh no! She burned the little box it came in?? Wow. @Drick: I would never say that your casseroles are trashy!! They are homemade and lovely, unlike things that come frozen in a box. @Pacheco Patty: Your mom's version sounds positively homemade compared to mine, lol. Your'e so funny, Trix! I used to love that kind of casserole too. In fact, I still do. When I cheat on my vegetarian diet, I make seafood and a more wholesome version of my Mom's tuna casserole often graces the table. Anyway, I love the look of your pretentious tuna casserole. Yum Yum! This looks so pretty! I haven't had any casserole for a while, wish I could taste some of yours now. Truffled salt AND truffle oil! Oh, me, oh, my! Oh wow, I am going to have to try your version - I've never had mornay with noodles, but it seems like a perfect match, so now I am going to have to try your recipe. Absolutely stunning photography also. With humor, all I can think to say is your turned trash to treasure presentation wise...but I taste is is yummy wither way! My goodness, this looks so delicious! What a beauty. Thanks so much for sharing it. 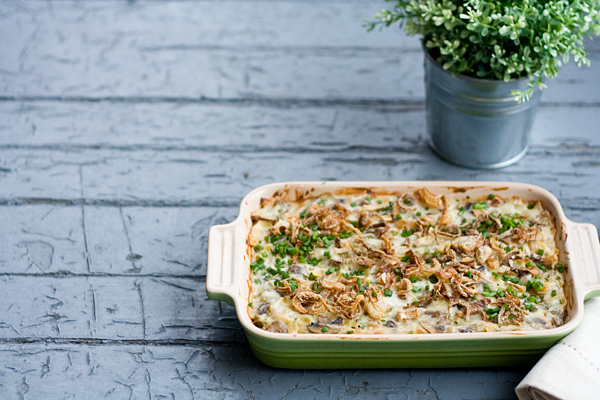 Ok...I'm usually not a fan of traditional tuna noodle casserole, but this looks fabulous! 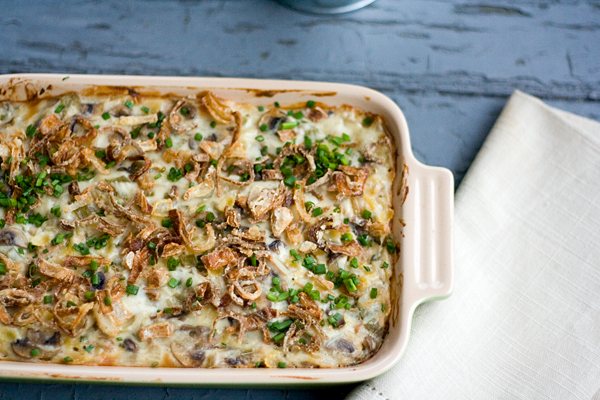 I love the upped up version and the shallots on top look right up my alley!